To find other places to visit, ratings, more things to do, and more tourist information, go to the Nusa Lembongan online vacation planner . Kuala Lumpur, Malaysia to Nusa Lembongan is an approximately 8.5-hour flight. When traveling from Kuala Lumpur in February, plan for a bit cooler days and about the same nights in Nusa Lembongan: temperatures range from 36°C by day to 28°C at night. Cap off your sightseeing on the 22nd (Fri) early enough to travel to Amed. On the 23rd (Sat), steep yourself in history at USS Liberty Shipwreck, have unforgettable encounters with a shark diving experience, and then tour the pleasant surroundings at Jemeluk Beach. To see ratings, reviews, maps, and other tourist information, read Amed online tour itinerary planner . 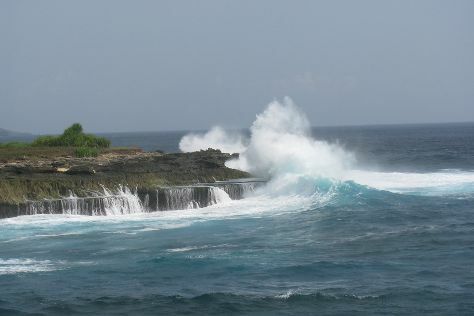 You can do a combination of ferry and taxi from Nusa Lembongan to Amed in 2 hours. Another option is to do a combination of ferry and bus. In February in Amed, expect temperatures between 36°C during the day and 27°C at night. Wrap up your sightseeing on the 23rd (Sat) to allow time to drive to Ubud. Start off your visit on the 24th (Sun): look for all kinds of wild species at Sacred Monkey Forest Sanctuary, then get a tailor-made plan with Sunsky Bali Tour, then take in the exciting artwork at Gallery Ada Garuda, and finally take in the exciting artwork at Dana's Paintings. On the next day, see the interesting displays at Neka Art Museum and then enjoy the sand and surf at Pantai Sanur. To see maps, ratings, photos, and more tourist information, go to the Ubud day trip planning site . Traveling by car from Amed to Ubud takes 1.5 hours. Alternatively, you can take a bus. Expect a daytime high around 36°C in February, and nighttime lows around 28°C. Cap off your sightseeing on the 25th (Mon) early enough to travel back home.